Tanzanian entrepreneur Mr. Justine Shirima, founder and director of Winning Creative, tells us about his dreams and the challenges he faces as entrepreneur. Why did you start your company in 2011? “I worked for a social enterprise OMASI. They strived to reduce poverty among Maasai people by setting up commercial businesses. As head marketing and sales I worked on projects in the area of milk and meat processing, so I already learned a lot about the meat business. At that time I started a very small meat business at my veranda at home. Packaging and selling beef fillet. 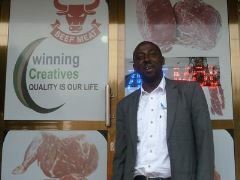 It went very well, so when the OMASI projects ended, I decided to fully dedicate myself to the meat business. Running my own business has always been my dream, this was the time to do it." How did your company grow in the last 6 years? What are the main challenges you face as entrepreneur? How do you outshine the competition? What is the impact of the SIF loan on your business? What are the most important entrepreneurial lessons you learned? “Start your business small and grow step by step. Take time to learn, you need it. Another lesson I learned is to have patience, especially with the governmental organisations. There are a lot of regulations, that don’t always make sense and take a lot of your time. Fighting it won’t bring you anything. Be persistent and have patience. But one of the most important lessons I would give to any entrepreneur is to put time and energy in building a good network and professional relationships. Be honest and do what you say you will do, so your clients trust you. This is essential for growing a strong business network." What are your dreams for your company? “ In 10 years’ time I want to provide 80% of the meat, chicken and fish in the hotels, camps and lodges we serve. This growth goes with an increase of our market share by 10% in the next 5 years. A nice dream that I want to turn into reality."